Can You Bring A Dog To The Airport To Pick Someone Up? As a pet parent, you must like to take your furry friend along with you everywhere you go. And most places welcome pups but can you bring your dog to the airport too? Especially if you are picking up or seeing off a loved one who would be delighted to have the pooch around. Airports rarely allow dogs on the premises unless it’s a service dog accompanying a disabled person, providing support or if the dog is traveling with a passenger. And even when they do allow them, your pooch must be on a leash at all times or kept in a pet container or a kennel. Airports don’t allow animals inside simply because it is not a place for them. There are hundreds of passengers traveling out and coming in, and your pup can get lost in all the hassle. Also, it may be an inconvenience for others as many people can feel uncomfortable around dogs and might complain to have your pooch removed from the premises. Moreover, such places are usually loud and crowded. If your pup isn’t used to being at such crazy public places, he might get anxious and start misbehaving. This could cause an unnecessary scene and trouble for you and your furry friend both. If your stay is longer than you anticipated, your furry friend may have to answer nature’s call, and since relief areas would be only available for service or traveling dogs, this can be a problem as well. 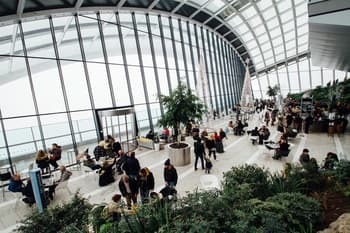 Here are policies of some popular airports regarding animals, these will give you an idea of whether you are allowed to bring your pooch to a specific place or not. The Hartsfield-Jackson airport has a pet policy which focuses on animals travelling with passengers and service dogs. An indoor Animal Relief Areas as well as a dog park are available. But it’s not clear what’s the policy regarding dogs hanging out in the arrival lounges. The Denver International, DIA is one of the most pet friendly airports across the US. It offers amazing care services for animals and features state of the art relief areas for pets traveling with passengers. But it also allows dogs to accompany the visitors while dropping off or picking up a passenger and in other public spaces around the DIA. Provided that these are service dogs. The Minneapolis-Saint Paul International Airport offers boarding facilities not just for pets of travelers but others too. But it requires these animals to be kept kenneled while at the premises if they are not service dogs. The Detroit Metro airport has lenient policies for service dogs and pets travelling with the passengers. But it does not allow other animals to hang out in the arrival or departure lounges and other public areas like ticketing keeping the convenience of other passengers in view. The Albany International Airport has a very clear policy against animals being allowed on premises. No animals are allowed on the terminals or other public areas unless they are service dogs or support animals which are there to support disabled individuals or are in pet carriers and kennels. The JFK International is pet friendly. But it requires animals accompanied by visitors to be properly secured in a kennel or on a leash. The Los Angeles International Airport, LAX does not have a clear policy about dogs present at the arrivals or departure lounges. It does however state that all animals must be kept on a leash and preferably inside the kennels at all times. The San Francisco International Airport provides relief areas for pets traveling with passengers and service dogs. They also have lodging services but no specific policies on whether they allow pups in the arrival or departure lounge or not. The San Diego International Airport has a Ready, Pet Go program which lets passengers interact with dogs for relieving stress and creating a friendly and relaxed environment for the travelers. Their policy about allowing pets at the arrival or departure lounge is not clear though. The Philadelphia International Airport has special areas provided for service animals and pets travelling with passengers. It does not state any specific guidelines about other animals hanging out at other public areas. The Tampa International Airport states that animals aren’t allowed inside the building. The only exceptions to this policy are working dogs that are kept on a leash and pets traveling in approved containers only. The Boston Logan Airport does not allow dogs inside the building unless they are in a kennel or other approved containers. The exception to this policy is service dogs but they have to be kept on a leash at all times. The Dulles International Airport allows dogs to hang out at the terminals and other public spaces provided they are on a leash at all times. The pets travelling with passengers and service animals are allowed to use the pet relief areas as well. Phoenix Sky Harbor International does not have a clear pet policy at arrival lounges but it allows all dogs to access its pet relief areas located outside the building regardless of breed, size and whether they are travelling. However, all animals are required to be kept inside kennels or approved containers inside the building with the exception of service dogs. Newark Liberty is considered friendly in terms of providing great relief areas for animals. However, they’re not allowed inside the terminals unless they are inside a kennel. 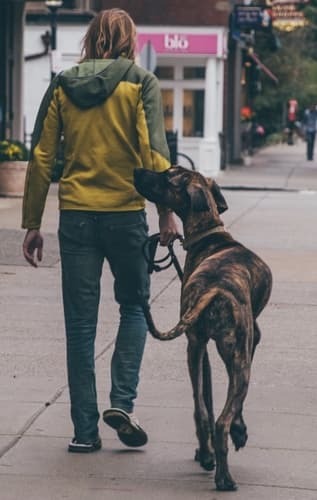 Pups are allowed on a leash only if they are service dogs or travelling dogs while they are going through security checks or using a pet relief area. McCarran International doesn’t have a clear policy for non-travelling animals. It states however that service animals must be kept on a leash at all times. Can You Bring a Dog to Baggage Claim? While dogs are not allowed inside the buildings, some airports may allow your pup to accompany you in the baggage claim areas since it doesn’t take long. But only if your pup is on a leash or in the kennel and is well behaved. Smaller pups may not be such a problem as you can carry them when necessary but large ones face stricter rules. 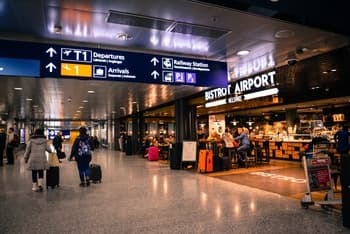 Keeping in view the policies of some of the largest and most popular airports, it is safe to say that dogs should not be brought to such places to avoid unnecessary trouble. Rather than being asked to leave the premises or having to leave your pup alone in the car, it’s a good idea to read the policy of the airport you are going to before or even call them up just to be sure. But, generally it’s better that you leave your pooch at home or in the car if you are not going to be gone for long. You can even get a sitter or drop your furry friend off at a friend’s place while you’re away if you plan ahead of time. Why Is My Dog Growling At Nothing?